I can't resist a book with gorgeous composition and the reminder that Earth is a network of life forms. With cutout phases of the moon and rhyming couplets, Moon swiftly became one of my favorites. The moon waxes and wanes as creatures around the world celebrate nighttime, making this the perfect goodnight book for a curious mind. 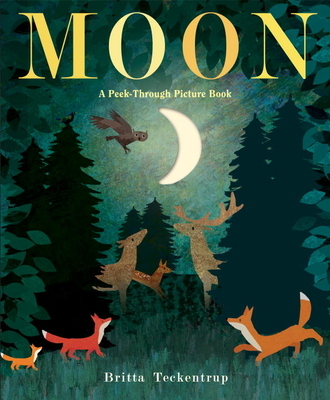 Next in the much-loved children’s series that began with Tree: A Peek-Through Picture Book is an elaborate book with peek-through holes that show the moon’s different phases with each turn of the page. Over deserts and forests, Arctic tundra and tropical beaches, the moon shines down on creatures around the world. Children will love discovering how it changes from day to day as the lunar cycle is shown through clever peek-through holes, each revealing the moon in a different size and shape. It’s the perfect light nonfiction book for young stargazers—and an ideal bedtime book, ending with a giant moon hovering over a sleepy town hunkered down for bed. Look for all the books in the Peek-Through Picture Book series: Tree, Bee, and The Twelve Days of Christmas. BRITTA TECKENTRUP has written and illustrated over seventy children's books, which have been published in over twenty countries. Her books include Tree, Bee, Moon, and The Twelve Days of Christmas in the Peek-Through Picture Book series, as well as Under the Same Sky, which was shortlisted for the Kate Greenaway Award. Born in Hamburg, Germany, and educated in London at St. Martin's College and the Royal College of Art, she currently lives with her family in Berlin. See her work online at brittateckentrup.com and follow her on Instagram at @britta_teckentrup.